First of all, we want to set everyone straight – the Pisco Sour was invented in Peru and will always be a national treasure. While some of our neighbors claim they are the inventor of the cocktail, do not be fooled. Americans have more of a claim to the drink than Chileans. In fact, according to Wikipedia, the cocktail originated in Lima, Peru, and was invented by Victor Vaughen Morris, an American bartender, in the early 1920s. Morris left the United States in 1903 to work in Cerro de Pasco, a city in central Peru. In 1916, he opened Morris’ Bar in Lima, and his saloon quickly became a popular spot for the Peruvian upper class and English-speaking foreigners. The Pisco Sour underwent several changes until Mario Bruiget, a Peruvian bartender working at Morris’ Bar, created the modern Peruvian recipe of the cocktail in the latter part of the 1920s by adding Angostura bitters and egg whites to the mix. 1. Blend the pisco, lime juice, egg white, sugar, and ice in a blender until smooth, about 1 minute. Pour into fluted glasses and top each with 1 to 2 dashes of the aromatic bitters to serve. 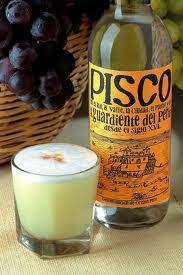 Start the weekend right with the amazing drink and let us know how your homemade Pisco Sour turned out.